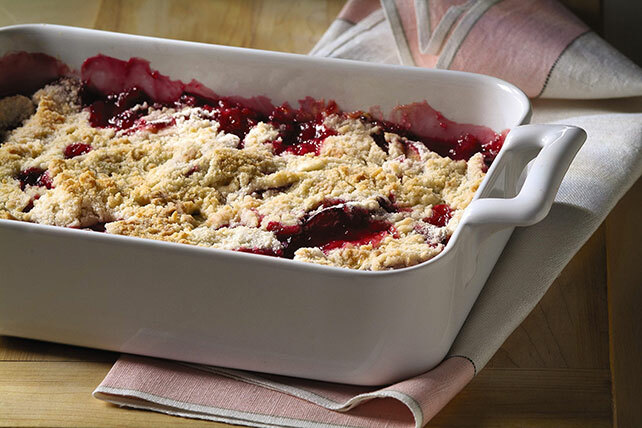 Prep our Juicy Plum Crisp in just 15 minutes. You'll never have to rely on a visit from the sugar plum fairy again thanks to our Juicy Plum Crisp recipe. Preheat oven to 375°F. Combine plums, 1/2 cup of the sugar, the tapioca and vanilla in 1-1/2-qt. baking dish; let stand 5 min. Meanwhile, mix flour and the remaining 1/4 cup sugar in small bowl; cut in butter with pastry blender or two knives until mixture resembles coarse crumbs. Sprinkle evenly over plum mixture. Bake 40 to 45 min. or until plums are tender and topping is lightly browned. Cool slightly. Prepare as directed, substituting peaches for the plums.